Following our commitment for the strict devotion to the advances of science and with our intention being the maximization of the successful procedures of assisted reproduction, our Center applies the revolutionary system of Continuous Microscopic Monitoring of the embryos. Special microscopic lenses are incorporated in the incubators. 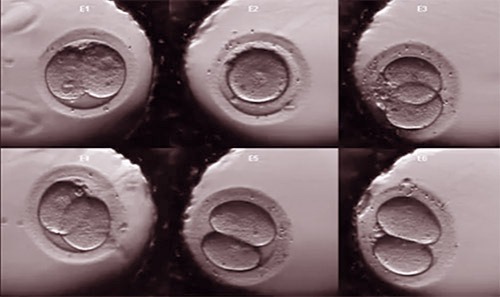 The embryos are placed in appropriate places in the incubators which are connected with these lenses and it is not necessary to move them outside of the incubator for monitoring as the observation of their development is done with external monitors. It is like there is a microscope inside the incubator watching night and day the development of each embryo separately. With the continuous and uninterrupted monitoring we receive crucial information for the development of each embryo and its implantation in cycles of In Vitro Fertilization. It is worth mentioning that the microscopic monitoring does not have any negative consequences in the development of the embryos. On the contrary, the findings that result from its application increase the chances of achieving pregnancy to 20%.